What about you? 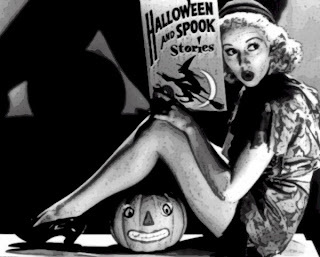 Do you have a favorite Halloween story? Though these days, most ghost stories portray spirits as malevolent, the holiday of long ago was a celebration of passed loved ones. People set places at their dinner tables to include the spirit, and lit candles to help the spirit find its way back to the spirit world. In Scotland, fortune-tellers recommended that an eligible young woman name a hazelnut for each of her suitors and then toss the nuts into the fireplace. The nut that burned to ashes rather than popping or exploding, the story went, represented the girl's future husband. In 18th-century Ireland, a matchmaking cook might bury a ring in her mashed potatoes on Halloween night, hoping to bring true love to the diner who found it. If a young woman ate a sugary concoction made out of walnuts, hazelnuts and nutmeg before bed on Halloween night, she would dream about her future husband. At some Halloween parties, the first guest to find a burr on a chestnut-hunt would be the first to marry; at others, the first successful apple-bobber would be the first down the aisle. A young woman who wished to see the face of her future husband would put some rosemary into her pillow, and then she’d dream of him that night. She could also bring a lantern to a fresh spring at midnight and see his face in the reflection. Halloween is a magical time. Ordinary boundaries disappear, and time has no bearing. Whether you believe the mystical aspect of Halloween or don't, I hope you enjoy it! Though not technically a Halloween movie, Young Frankenstein is a one of my favorites for this time of year. Happy Halloween to you too Cate. I'm going to dress up as a ghost and go trick or treating. Not very original? Well it'll frighten the living s**t out of the neighbours because we don't have Halloween here!